It is economic reasons that Maja Reichard select to end the active career, with only a little over a year to go to the Paralympics in Tokyo.
" I can't be bothered to anymore, it takes a lot of energy to pull together economy. It is very much hopes that then does not come true, " says Maja Reichard to SVT Sport. 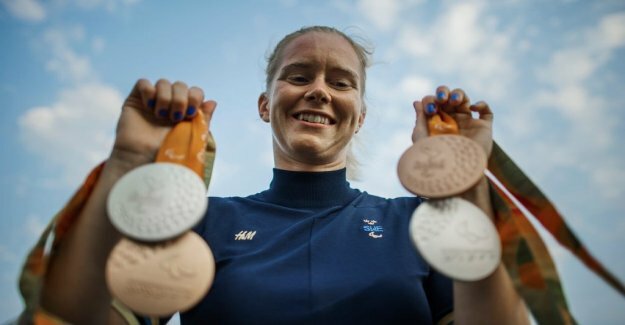 At the Paralympics in Rio 2016 was Maja Reichard alone for 40 per cent of the total Swedish medaljskörden, two silver medals and two bronze medals. Reichard was also a Swedish standard bearer in Rio. she has put a lot of effort in to integrate parasimningen in the swimming federation's activities and, among other things practiced together with Sarah Sjöström and Michelle Coleman. Maja Reichard has competed in the class for totally blind swimmers. She was born partially sighted and lost sight more and more and at the end of adolescence become completely blind. When she won her paralympic gold in London 2012 she hit her own world record twice, first in the trials and then also in the finals.
" I am extremely proud of my Paralympic gold in London. It is the biggest you can win, and I did it on my first Paralympics. Reichard, taken eight world CHAMPIONSHIP medals including three gold. 2018 took Reichard two bronze medals at the european CHAMPIONSHIPS in Dublin, 50 metres free and 100 metres breaststroke. Reichard has been nominated for the Jerringpriset three times, received the Radiosportens price ”this Year's rising stars” in 2011 and was appointed by the Stockholm sports federation and the Sportsjournalisternas club Stockholm ”Stockholm's foremost athletes of the year 2012”.